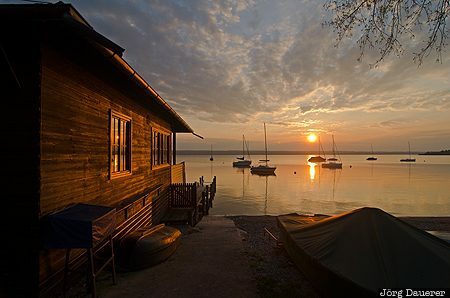 The sunset over Ammersee illuminates a wooden boat house in Herrsching with sailing boats in the background. Herrsching am Ammersee is south west of Munich in the county of Oberbayern, Bavaria, Germany. This photo was taken in the evening of a sunny day in April of 2011. This photo was taken with a digital camera.